Yesterday I made a new dish a nice twist on panzanella a wonderful version from Heidi Swanson and is was a great new addition to steak night side dishes. I wanted something simple and different and this sure fits that bill, I started out cutting the Dijon mustard in half tasted and then decided to add the full amount for a tangy mustardy taste. A simple dish and this week’s contribution to the cooking club…I didn’t adapt the recipe and I think maybe toasted pine nuts would be a nice change, but I already had some toasted sesame seeds ready to toss into the salad. This week a lot of seasonal vegetables on the menu so I look forward to making a few new to me dishes using squash, kale and sweet potatoes to name a few and this weekend Sunday’s soup is going to be a hearty minestrone that I posted a couple of weeks back. 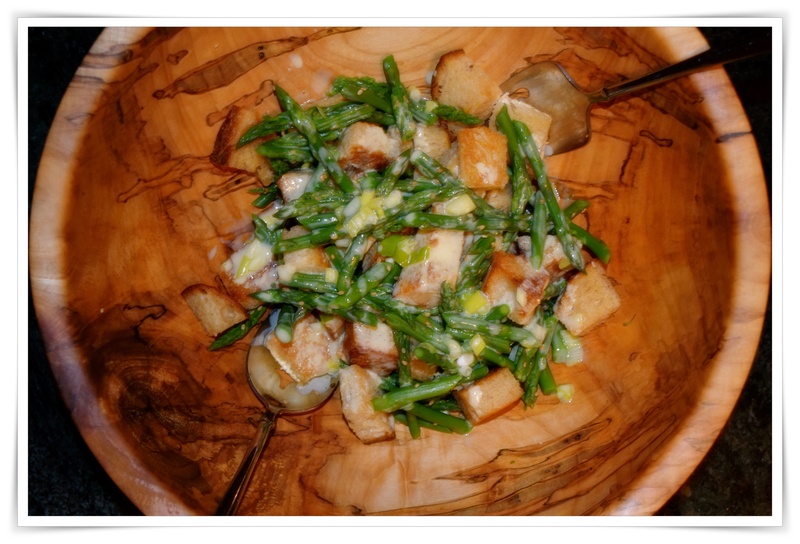 Heidi Swanson Asparagus Panzanella – slightly adapted and served at room temperature. Whisk together the buttermilk, olive oil, mustard, vinegar, half of the scallions, and a couple of pinches of salt. Taste and adjust if needed, before setting aside. Trim the tough ends from the asparagus, and cut into ½-inch segments, on a bias. Melt the butter in a large skillet, add the bread, toss until well coated, then toast, tossing now and then, until golden. Transfer to a paper towels. Bring a saucepan of water to a boil, salt generously, and blanch the asparagus until just tender – 20 seconds or so if your asparagus is thin, a bit longer depending on thickness. Drain, and rinse under cold water to stop the cooking if you’d like to serve this cold. Alternately, transfer the asparagus directly to the serving bowl without the cold water rinse, if you’d like it warm. Add the remaining scallions, a good splash of the dressing, toss well, and decide if you’d like more dressing. Finish with the sesame seeds, toasted bread, and a sprinkling of herb blossoms if you have them.